A warm welcome to all of the members of our Aroma Tours Newsletter in more than 35 countries from around the world. 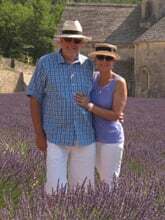 Robbi and I are now in Provence taking a short break before beginning our Aroma Tours adventures in this beautiful region with our Heart of Provence Tour. We have already completed three wonderful tours in Spain, Dordogne and Turkey and with happy hearts we look forward to sharing many more memorable moments with our guests, almost half of whom are joining us once again. We feel truly blessed to be able to share our passion for the places and experiences that we love with wonderful people from around the world and as we start to throttle back on the number of tours we are offering it becomes even more poignant for us. There are still a few places left for this year in Tuscany and Bali and we look forward to welcome the last few Aroma Travellers for this season shortly. Next year's season is off like a rocket with half of our tours for 2015 already half full! This year we are enjoying an outstanding number of returning Aroma Travellers and new guests who are joining us because of direct referrals - currently over 49% of our guests! For Robbi and myself, it is such a great delight to welcome back so many good friends and to see our Aroma Tours continuing to flourish. Let The Photo Fest Continue! In our last newsletter we began sharing some of the wonderful photos that have been kindly contributed by our past Aroma Travellers chronicling some of the delightful moments that we have experienced together over the last 20 years. It is such a pleasure to share these beautiful images of Spain, Dordogne, Turkey, Provence, Italy and Bali that capture our adventures together from a more personal perspective. In addition to these new photos in our newsletters, we invite you to return from time to time to our Picture Gallery Page for the latest photos of our adventures. 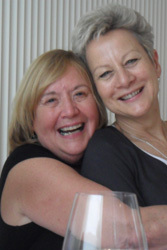 Our Aroma Tours Photo Fest continues with images of Spain taken by Candy DeGreene from Lancaster USA who has been on two tours with us and is shown here giving Robbi a thank you hug after a truly memorable meal in one of Spain's finest two star restaurants. Candy's character shines through in these beautiful photos that capture the spirit of our journey in Spain and also showcases her clever eye and big heart. It is always a joy for Robbi and I to share our love of the places that are special to us with lovely people from around the world and over the coming months it will be our pleasure to introduce you to more of these wonderful people through their photos. Tuscany and the Dolce Vita Anyone? Due to a late transfer to 2015, there are currently 2 places available for our popular Aromas of Tuscany Tour this September ( next year's tour is already half full ). 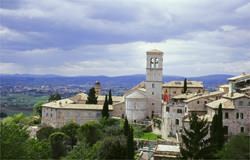 This tour has been fully booked for months but if you would like to join us in the beautiful Tuscan autumn for a delightful exploration of that most Italian concept - The Dolce Vita, it is now possible. As well as nourishment for the eyes, in Tuscany life takes on a different pace with long lunches in beautiful hilltop villages, wonderful coffee, delicious wines, truffles, armegiano cheese, porchini mushrooms, prosciutto, fresh pasta..... [ so many wonderful tastes ], laughter and the fine Italian art of "dolce fa niente" - sweet doing nothing! Our journey is also about absorbing the richness and passion of Italian life and savouring its cultural heritage evident in the art, architecture, pageantry, festivals, fashion, design, craftsmanship and unique approach to living. We are all destined to be transformed by the magic of this place - feeling more Italian moment by moment, speaking more enthusiastically, smiling broadly and even display a bit of emphatic arm waving! If you would like to join us this year as we explore Tuscany's perched villages, rolling hills, delicious food and wines, rich culture and joy of life we invite you visit our information request page for more details or visit our Booking Page to secure these last places. We are thrilled to be enjoying our best ever tour season, with the largest number of bookings we have ever achieved with just a few places left and we will be full once again. We already have a significant number of early bookings from returning guests and folks who missed out on getting a place this year and as a result, half of our 2015 tours are already almost half full. Robbi and I hope to have the pleasure of welcoming you to one of our delightful aromatic adventures and to sharing a wonderful and memorable time with you. Our planning for 2015 is now finalized and the full list of tours that we will be offering is shown above. Before every tour season I spend a significant amount of time travelling about checking all of the particulars for our upcoming tours, including finalizing the menus at the beautiful restaurants we enjoy during our time together. It is one of my great joys to visit our restaurateur friends to chat about arrangements, catch up on the news and maybe share a glass of wine; knowing that their skills and hospitality will soon be shared to tantalize our guests. This time I would like to share my roving gastronomic experiences in north eastern Spain ( hence the name of this article ) researching for our Flavours of Spain Tour which next year will include the spectacular and elegant city of Barcelona - one of the world's food capitals. They say that the first bite is with the eye so I hope you enjoy sharing some of the culinary experiences our guests we will enjoy next May in Spain. There is quite a constellation of Michelin stars on display here and Robbi and I hope that we will have the pleasure of sharing these amazing gastronomic experiences with you next May during our aptly named Flavours of Spain Tour. Please note you need to replace the '+' in our phone number with your country's international dialing prefix: from the USA/Canada it is 011 from most other countries it is 00.